5 most common causes of plantar fasciitis. Learn all you need to know about this painful condition. The term Plantar Fasciitis is derived from the words plantar referring to the bottom of the foot and fascia, which is a fibrous tissue that attaches to the bottom of the heel bone and extends forward to the toes. Plantar Fasciitis is simply referring to inflammation of the fascia. This is a very common condition that will affect approximately 1 out of every 8 people in their lifetime. 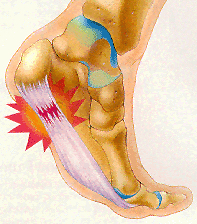 The typical symptoms are a burning pain and irritation just forward of the calcaneus (heel bone). This pain sometimes will lead to the arches of your feet. Pain is usually intensified after a period of rest such as sleep or extended periods of sitting. When you walk or run, your long arch acts as a spring rising and lowering with each step. What is actually happening is that upon weight bearing, your foot will elongate or lengthen, stretching the Fascia. When this “spring” action occurs, the fascia can stretch to the point that irritation or tearing of the fascia occur. This condition is often referred to as Plantar Fasciitis also many people improperly use the term “heel spur” or “stone bruise”. Over the past 30 years I have been custom fabricating braces and foot orthotics for just about every type of foot, ankle and knee problem, about 70% of the custom orthotics that I have designed were for Plantar Fasciitis. I have heard many crazy theories on how people have acquired this condition. The fact is that anyone can develop this condition. Whether you are overweight, underweight, a tri-athlete or a couch potato. Plantar Fasciitis does not discriminate. If you need to know the most common causes, then read on, hopefully it will help you identify what you are doing right and wrong. The # 1 cause of heel pain! The most frequent cause of Plantar Fasciitis is an abnormal motion of the foot called excessive pronation. Normally, while walking or running, your foot will strike the ground on the outside edge of the heel, then begin to roll in and forward toward your toes Your arch should flatten slightly during this motion. If your flattens too much, you have what is commonly referred to as excessive pronation. 1) Sudden gain in weight. Sometimes quick, excessive weight gain does not allow the body time to adjust to the extra weight load that it is now bearing. The connective tissues (tendons, ligaments and fascia) do not have adequate strength and flexibility to support the extra load and now connective tissues are over stretched and begin to fail. It is a very common occurrence for someone to land improperly while jumping, running, climbing a ladder or even stepping off the curb. When your feet do not strike the ground properly you can over extend their mechanical limitations and damage the plantar fascia. A very large majority of the people think that if you are having problems with your feet then you must wear soft shoes. Nothing could be further from the truth and I will explain why. If you are having a problem with your heels, ankle or knees it is safe to say that you are having a “biomechanical problem”. This means that your body and foot mechanics are not functioning properly. For example, some people reason that, if you wear soft, flexible shoes for walking then you are absorbing shock forces. To a certain extent this is true but what they do not realize is that a soft shoe, even when it is brand new, will collapse under the impact forces of the average walker or runner. A soft sole of the shoe will compress to the point that the foot and ankle will roll in or out so much that the arch can flatten and all of the connective tissue, or in this case the plantar fascia, will be over stretched causing irritation or tears in the fascia. When you wear a firm, stable shoe the sole of the shoe will not collapse. This will keep your feet and your ankles aligned properly, resulting in reducing the stretching of the fascia. Yes, it is that simple. Just remember that a firm shoe will control your foot and ankle motion and in return reduce over stretching on the connective tissues. 4) Running or walking uphill. Another common cause and irritation of Plantar Fasciitis is walking or running uphill. The position that the foot and ankle are forced into while walking uphill. This causes an excessive range of motion on the joints of the foot. Which in turn, will cause the fascia and other connective tissues to be overstretched. Proper stretching is the one of the most important things you can do to protect your body from injury. Regular stretching will also lead to reduced muscle soreness after running and better performance. When stretching before running or other physical activities it is important to start out slowly. Do not bounce or stretch your muscles beyond the point where you begin to feel tightness. Start slowly and maintain stretches for 10 to 15 seconds, rest between stretches and always listen to your body. If you are feeling any burning sensation then you are probably over stretching the tissue, which may result in injury.